Editor’s note: Like some of the programming tutorials, you may find the search bar tutorial no longer works in Xcode 5 and iOS 7. We’ve rewritten the tutorial to make it compatible with the latest version of Xcode. 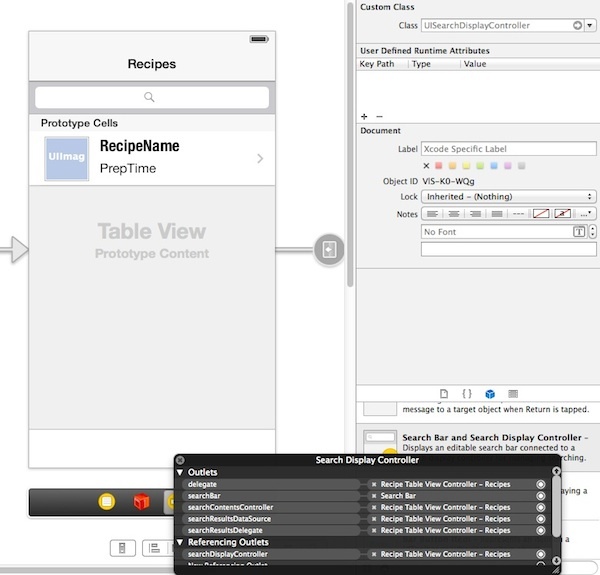 On top of that, we enhance the tutorial with custom table cell. Enter the search bar tutorial. In most of the iOS apps using table view, it is common to have a search bar at the very top of the screen. How can you implement a search bar for data searching? 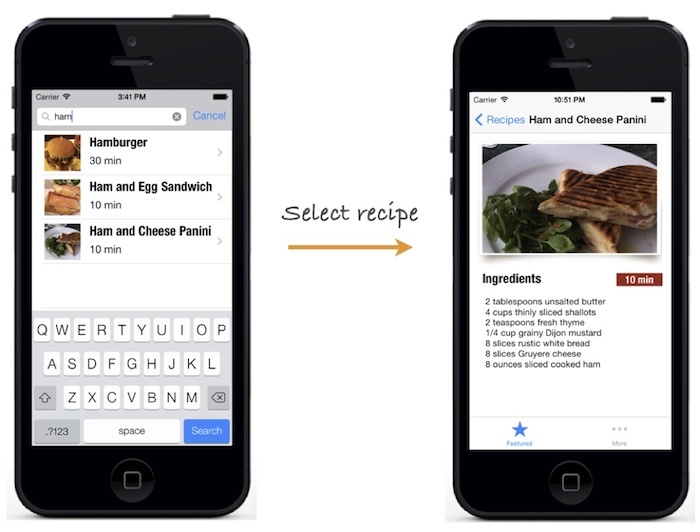 In this tutorial, we will see how to add a search bar to the recipe app. 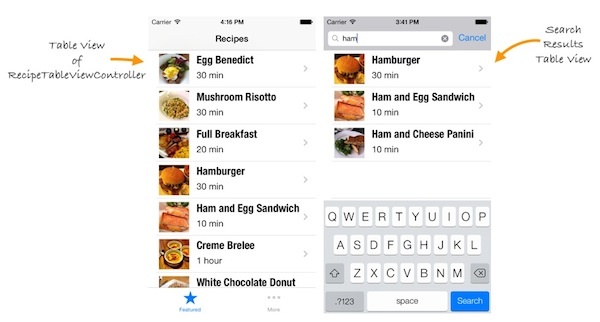 With the search bar, we’ll enhance the recipe app to let users search through the recipe list by specifying a search term. Well, it’s not difficult to add a search bar but it takes a little bit of extra work. 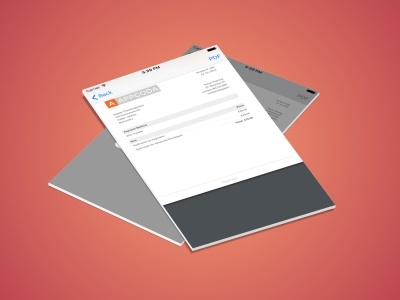 As usual, we’ll walk you through the concept and implementation by building a sample app. As our focus is on the search bar implementation, you can download this project template to start with. The template is similar to the app we built in the tab bar tutorial. You can use search display controller (i.e. UISearchDisplayController class) to manage search in your app. A search display controller manages display of a search bar and a table view that displays the results of a search of data. When a user starts a search, the search display controller will superimpose the search interface over the original view and display the search results. Interestingly, the results are displayed in a table view that’s created by the search display controller. Like other view controllers, you can either programmatically create the search display controller or simply add it into your app using Storyboard. In this tutorial, we’ll use the later approach. Before proceeding, try to run the app and see how it looks. Without implementing any new code, you already add a search bar. Tapping the search bar will bring you to the search interface. However, the search is not working yet. Why Search Results Show All Recipes? As mentioned earlier, the search results are displayed in a table view created by the search display controller. When developing the recipe app in earlier tutorial, we implemented the UITableViewDataSource protocol so as to tell the table view the total number of rows to display and the data in each row. The search results table view’s data source, which is needed to provide the data for search result table. The search result table view’s delegate, which is used to respond to the user’s selection of a search item. The search display controller’s delegate, which responds to the events such as when the search starts or ends and when the search interface is displayed or hidden. The search bar’s delegate, which is responsible for responding to changes in the search criteria. Generally, the original view controller is used as the source object for the search results data source and delegate. You do not need to manually link up the data source and delegate with the view controller. As you insert the search bar into the view of Recipe Table View Controller, the appropriate connections for the search display controller are automatically configured. You can right click on the “Search Display Controller” icon in the dock to reveal the connections. This explains why the search results show a full list of recipes regardless of your search term. You can change the row height by implementing the tableView:heightForRowAtIndexPath: method of the UITableViewDelegate protocol. Here, we set the height to 71 points. If you compile and run the app again, the table row in the search result should look better now. Yet, the search still doesn’t work and this is what we’re going to discuss in the next section. Change the data source methods to differentiate the table views. If the tableView being passed is the table view of Recipe Table View Controller, we show all recipes. On the other hand, if it’s a search result table view, only the search results are displayed. First, we’ll show you how to implement the filter. Here we have an array to store all recipes. We create another array to store the search results. Let’s name it as “searchResults”. Here we choose to use the “contains” filter. The operator “[c]” means the comparison is case-insensitive. With the predicate defined, we use the filteredArrayUsingPredicate: method of NSArray that returns a new array containing objects that match the specified predicate. To learn more about Predicate, check out Apple’s official documentation (https://developer.apple.com/library/mac/#documentation/Cocoa/Conceptual/Predicates/predicates.html). When user keys in the search term in the search bar, this method is invoked automatically with the specified search term. We then call up the filterContentForSearchText: method to do the search. The comparison is pretty straightforward. You can simply compare the tableView object in the data source methods against the searchResultsTableView of the search display controller. 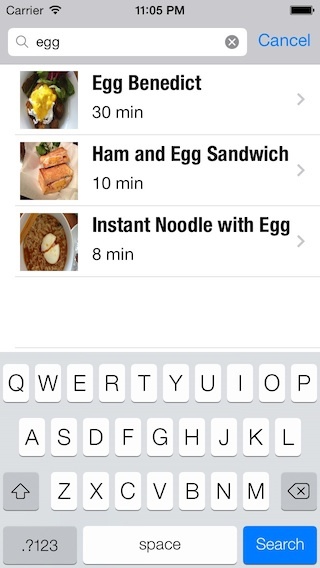 If the comparison is positive, we display the search results instead of all recipes. Once you complete the above changes, test your app again. Now the search bar should work properly. Despite the search works, it doesn’t respond to your selection correctly. 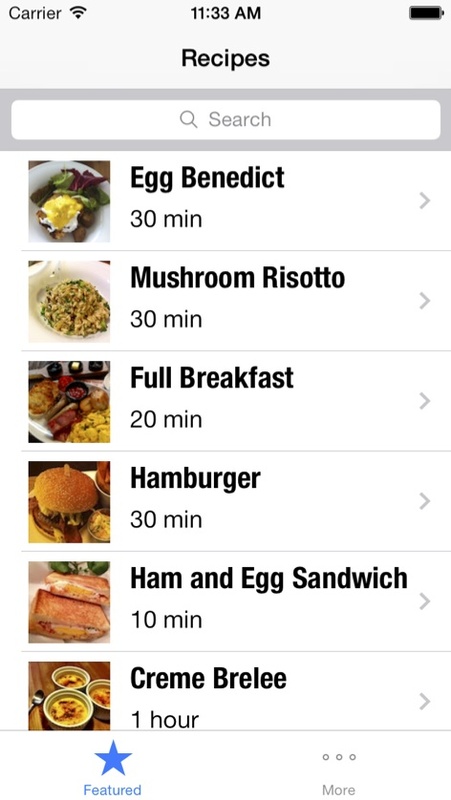 No matter what the search results are, the app always displays “Egg Benedict” in the detail view. We first determine if the user is using search by using a built-in active property in UISearchDisplayController. In case of search, we retrieve the indexPath from searchResultsTableView and get the recipe from the searchResults array. Otherwise, we just get the indexPath from the table view of Recipe Table View Controller. That’s it. Run the app again and the search selection should work as expected. By now, you should know how to implement a search bar in iOS app. 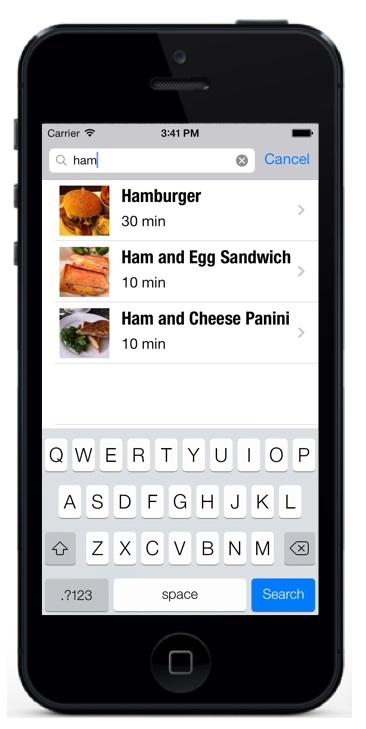 In this tutorial, we made the Recipe app even better by enhancing it with the search feature. The search feature is particularly important when you need to display tons of information in table view. So make sure you understand the materials we’ve discussed in this tutoral. Otherwise, start over and work on the project again. What do you think about the tutorial? Leave me comment and share your thought. 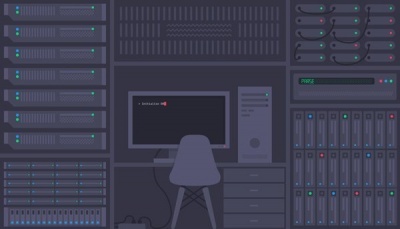 There are more programming tutorials in our free iOS course. Don’t miss it! Did you have any luck with sections? I have been trying for days! Hi, when I drag the search bar with display controller then when I click the search bar the keyboard appears and overshadows my searchbar as shown in the image. Does it happen to someone else? What’s the solution for this? I also encountered this issue. Now I have fixed it. The reason was that when I drag the search bar to add it in, I didn’t put it at the correct place. You must make sure that the search bar is completed below header, and completely above the prototype cell. Hope it helps. You are super awesome it works. For those who have error : dequeue a cell with identifier ……..bla bla bla. i have this problem and i couldnt solve it til i saw your comment.Thanks very much.You save my life…. In the first statement you are using tableview instance provided as argument and the other is you are using instance you declare outside in the self object. Only possible reason first statement have not worked i you might not have registered cell with this id to the table instance passed in delegate method. 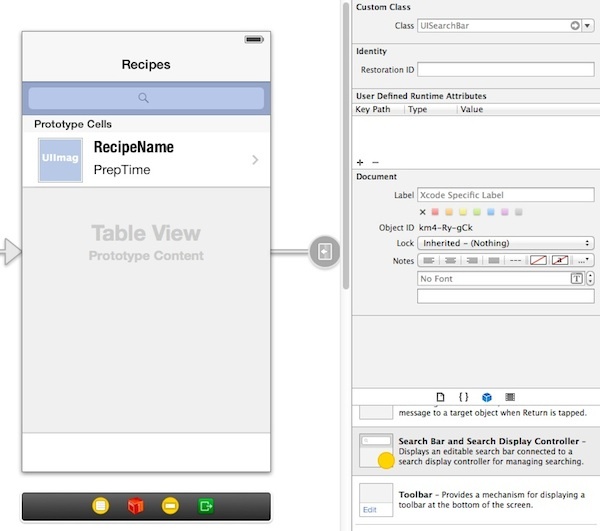 For example in search controller, tableview instance is different than the table you have created. If you have created cell in storyboard or registered it to self.tableview manually. You should fix this, otherwise you are sending cell owned by one tableview to another tableview. tengo problemas con el Search Bar y Search Display lo adiciono a un table view, pero no me filtra, este es el código que estoy utilizando, agradezco si me pueden ayudar. what we have to do if we does not create new Receipe class, instead we want controller to be display all information (label1+label2+image) on searchResults. Absolutely awesome tutorial, per the norm. Thank you guys! how do we make part of the words in detail view bold or italic or change paragraph if al data is taken from a plist file? Because search table is not registered with any cell, in second code you are creating cell if not found so it works fine there. This tutorial a lot interesting!!! Thank you!!! As said below, a great addition to this would be sections, can anyone help with this? Is it possible to add a scope bar not only to search for the recipe but also search for the ingredients? How can i choose the source of the search? Thank you soooo much for this series of tutorials for IOS! You are really amazing! I hope that I learn a lot with it… I really would like to have some apps runnings in AppStore (and make some money with it, lol)! hello there, i successfully follow this tutorial and it runs perfectly on my app. but i’m wondering why did – (void)filterContentForSearchText:(NSString*)searchText scope:(NSString*)scope method doesn’t appear automatically when i start typing? I figured it out. i think it happens because we didn;t include UISearchDisplayDelegate on .h file. the first statement didnt work. So, I have a rather dumb question which judging by the age of this article may not be answered. I just recently started TRYING to learn to program with the iPhone using xcode 5 & obj-c. With this tutorial I noticed that it limits how many items can show up on screen. Is there a way to make it display more than 20/25 items? Thanks! Can anyone tell me how to implement this when fetch data from Core Data using NSFetchedResultController ? Great tutorial. I’ve spend many hours trying to figure out how to have a filtered search result go to a specific viewcontroller? I’ve been able to get items on the non-filtered list to go to a specific viewcontroller using the if (indexPath.row == 1) under the tableview didDeselectRowAtIndexPath. Any suggestions would be greatly appreciated! i didn’t implement this part on existing code and it didn’t let to display search results. after debug i saw that the both tableViews (self.tableView and searchResultsTableView) have different id’s. in this case returns the following condition always false. I solved it checking if searchDisplayController is active and so works for me. I get an error code when i tap on the search bar before adding in any programming behind it at all, when it should just be not filtering the table. I continued any way and got the same error after following this tutorial completely. This time, it works unless you use the search bar, which looks normal and functioning until you type in any letter, then it crashes and gives the same error code. Any ideas or help would be awesome, because i’ve followed lots of tutorials for search bars and they all cause the same problem! I’ve done it programatically and, I don’t know why, after the text in search bar is edited, the method cellForRowAtIndexPath is not being invoked. However, the numberOfRowsInSection is being invoked normally. This way, the table is never updated according to the text search. Does anyone know what is going on, and what should I do solve this? Great tutorial !! but I have a question, I followed your exact code but when I added more data to the array the controller prints only the the first 7 items (although I have added them the array 🙁 ) how can I fix it :(? Hi, your tutorial is awesome as always. I have a question, Can I implement these methods on UITextField? 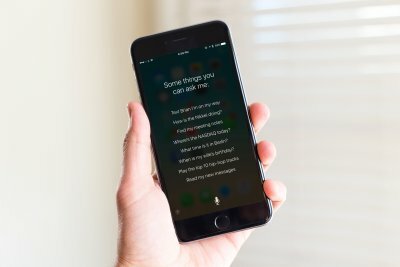 If not than How can I customize the UISearchBar as UITextField? What about searching through a mutable array full of NSDictionaries? Why can I have empty cells in search results instead of my custom prototype cells? Debugger shows, that cell is dequeued but all the outlets are nil.. Thank you very much for helpful tutorial. But can anyone explain me how to keep search bar on the top. For now it scrolls down with table cells. NSLog(@”not search”);// always go this although i’m searching. And it works but indexPath.row always equal to 0 although results have much more than one row. Same problem, this does not work anymore with latest xcode. 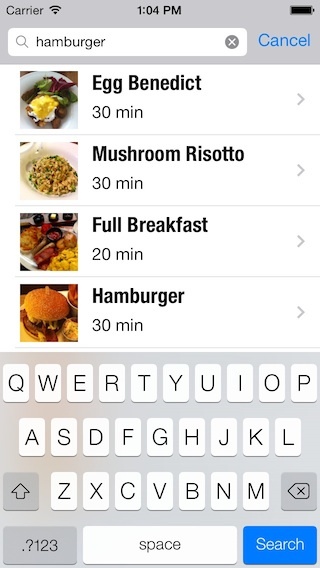 How is this different from the new iOS8 UISearchController Delegate? Can you create tutorial on that? Thanks! Hi , if my data is in Parse , i can use this tuto to add search bar with sdk Parse ? I’m using xcode 6.1 and not able to get either the starter or final project to compile. The error I’m getting is : clang: erro: no such file or directory ‘/Users/brandonmc/Downloads/RecipeAppSearchBar/CustomTable/CustomTable-Prefix.pch; clang error no input files Command /Applications/Xcode.app/Contents/Developer/Toolchains/XcodeDefault.xtoolchain/usr/bin/clang failed with exit code 1. The .pch file I have in the project is RecipeApp-Prefix.pch. Me too on 6.1, did you ever solve this? This app appears to be an older app renamed. You can fix by editing prefix-header to reflect “RecipeApp-Prefix.pch” in the Build Settings and one adjustment to linking. Two screenshots attached should help. Please send me Debug and Release full path? Great tutorial. Unfortunately key methods used in this example have been depreciated in Xcode 6. Will you update this tutorial ??? Thanks! Made my life easier. Could you guys give any help how to implement the SearchBar in the Parse.com example ? Considering not just me but other people who bought the course too, Im 100% sure that would help everybody. You guys can push as update via email or post the .zip project to the url of the dropbox Recipe Parse Part 2 example of the book. Thanx and cheers! You have solution about SerchBar in the Parse.com? RESPECT!!!!! thanks!!! really really Thanks! Any updates on this tutorial? The methods in this example is deprecated already in Xcode6. Thanks! Nice tutorial but is there any update to this? the methods used here are deprecated already in Xcode 6. Thanks! While i drag Search bar and search display controller onto Recipe tableview controller. Its not being added onto Recipe TableView Controller . I dono why ? Please update for iOS 8, I know that this is free and you are probably busy but the whole search function had been changed in iOS 8. So please update this tutorial and explain briefly on the protocol “updateSearchResultsForSearchController” .. Thanks in advanced ..
how to implement the SearchBar in the Parse.com example? This really does me no good when I would be searching for ingredients to recipes, not just recipes. The search capability needs to expand into the other subviews. Can anyone upload the source code again? It have been deleted. Thank you very much!